Reecer Creed Rd and the drive out to Lion Rock is an easy drive. Some years the road can be bumpy and having high clearance can be helpful. The last bit of the road towards Lion Rock was aweful! Kirsten drove her Subie but the road as snot slick mud in some places, bit washed out gullies in others. It's a great trip to do just to see the flowers starting to come out. More information on the lookout: Lion Rock was a former lookout site. It was established as a camp (crow's nest tree platform) in the 1920's and then replaced with a 40' pole L-4 tower in 1932. 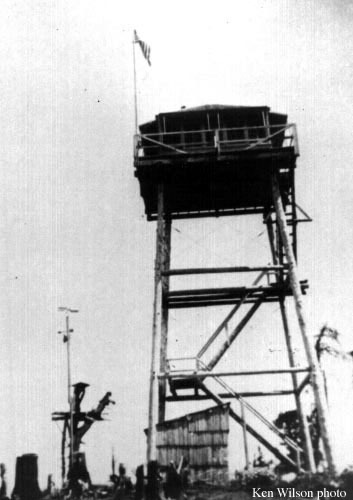 A newer 40' L-4 tower was built in 1948 but then destroyed in 1967.